» Why Did WW2 Take Place? Why Did WW2 Take Place? Although each of the regional wars of WW2 began for a different reason, it is generally understood that WW2 was started because of Axis aggression. In Europe, the cause of WW2 could be traced 20 years earlier. 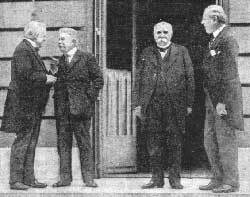 At the end of WW1, the Treaty of Versailles failed as an instrument to maintain peace as it seemingly served the agenda of depriving Germany of her status as a sovereign nation. Such deprivation, along with the subsequent hyperinflation and global economical depression, set up the grounds for the rise of the Nazi Party. Many scholars note that Europe might had saved had the Western Allies abandoned the policy of appeasement, which was done in the interest of curbing the expansion of communism. Prompt action committed by the Western Allies against Germany might had removed Adolf Hitler from power, hence possibly lessen the scale of the war. Additionally, the Nazi Party's racist agenda also provided Germany a distorted justification for their brutal occupation policies. Italy, which fought on the side of the victors in WW1, believed she deserved much more territorial gains than it received at the end of that conflict. This led to Italy's belief that her invasions against Abyssinia, Albania, and Greece were justified. In Asia, Japanese expansion led to a brief confrontation with Russia and a full-fledged war against China. The primary motivation was to acquire natural resources to feed the rapidly growing Japanese industry and military. The western imperial powers had long been fueling their industrial might by exploiting their colonies, but Japan, late to the imperial game, always had to import raw materials from abroad. The subsequent Japanese expansion into the South Pacific was Japan's attempt at establishing her base for raw materials, particularly oil, and this attempt brought it directly against the interests of the United Kingdom, the Netherlands, and the United States. Why did WW2 end the way it did? WW2 ended with an Allied victory after Germany and Japan surrendered in 1945. The main reason for the eventual Allied victory was more so economic in nature than military. The Allies possessed vast manpower, raw materials, and manufacturing capacity, something the Axis could not match. As the war dragged on, the Axis powers simply could not handle the seemingly endless supply of weapons that the Allies could bring to the front. This information was very useful to me. I'm glad I found this site. useful but part are incorrect. this rocks i got the first one done in class for some project i just needed to copy and paste! Why was World War II so important? This website was extremely helpful and helped me write a 10 page essay about Germany. mmm... this didn't help. try writing the FACTS and the IMPORTANT STUFF. this was really helpful, and extreamly interesting as well!!! it was not that good because it did not give me all that I wanted I thought that the Japaneses wanted more land than that small island and started the second world war that involved the allied force and the Japaneses. Did not rilly help me at all. I did not see what I was looking for, I was looking for a reason of war as in a murder or huge fight, not a piece saying axis war or racism.